PIER 22 offers a chef-created sweetheart dinner menu this Valentine's Day. Housemade preparations include satisfying main courses such as wasabi-crusted ahi tuna, New Zealand rack of lamb, roast duckling and housemade sushi. Also on the menu, guests will find romantic concoctions such as the chocolate kiss and chocolate covered cherry martinis, the ruby fizz cocktail, champagne for toasting and an award-winning wine list. Executive chef Greg Campbell further suggests topping off your meal with a bit of espresso and a tasty homemade dessert for the perfect finish. 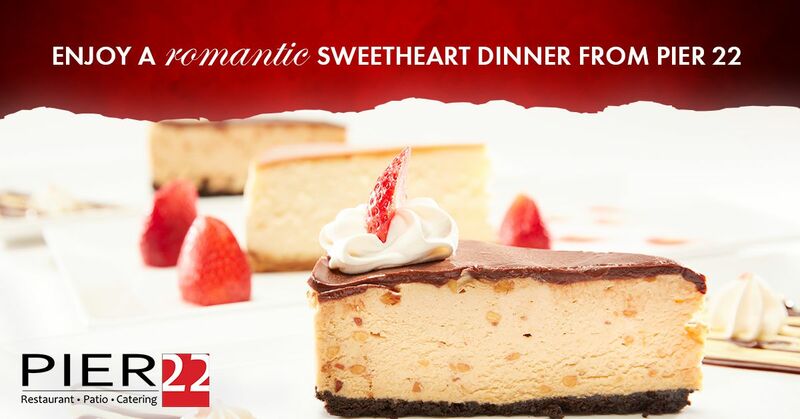 Everyone knows that Valentine's Day is truly all about the chocolate, and PIER 22 offers plenty of options to curb that sweet tooth including chocolate peanut butter pie, tiramisu, chocolate banana bread pudding, New York cheesecake, and more! What's more, the icing on the cake for anyone enjoying a meal at PIER 22 is the service and ambiance. The restaurant overlooks the Manatee River in downtown Bradenton; window seating and al fresco dining boast stunning sunset views, and knowledgeable waitstaff provide first-rate service. All of this and more makes for a lovely date night out. In fact, PIER 22 has a reputation as Bradenton's most romantic dining destination and recently received first place in the Bradenton Herald's People's Choice Poll for Most Romantic Restaurant along with first place in the Herald Tribune's Manatee Readers' Choice Poll for Most Romantic Restaurant. Reservations are strongly encouraged and can be made online at https://pier22dining.com/reservations or by calling the PIER 22 reservations desk at 941-748-8087.